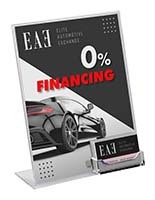 Sign display lets you create your own advertisements. 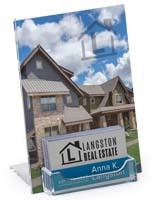 Tabletop design is perfect for cash wrap areas. 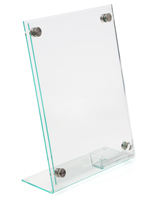 Clear acrylic pockets showcase gift cards beautifully. Gift Cards are everywhere today and need to be shown to their best advantage. 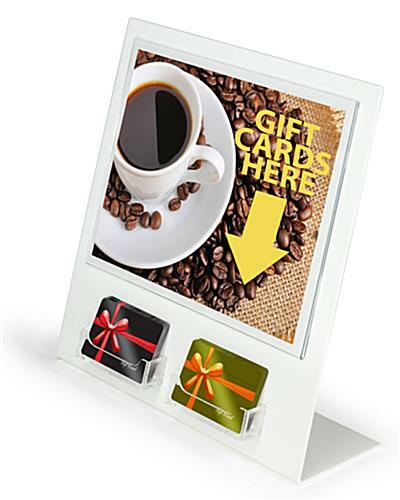 With our new gift card display, these cards will be at attention on your countertop. 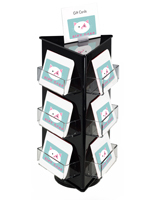 Included on this display is an 11" wide x 8-1/2" tall acrylic sign holder. 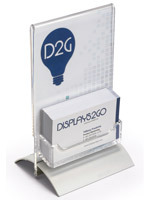 All you have to do is print out your own standard-size custom insert and slide it into the top of the sign holder, as the photo indicates. That's it! 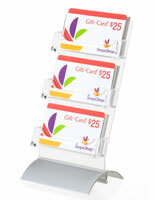 The card pockets can hold any gift card that is not pre-packaged. If your pre-paid gift cards are works of art in themselves, show them off to your customers instead of hiding them behind wrappers. 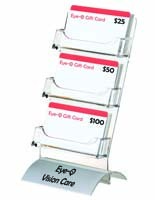 Our Gift Card Display will place your cards where you want the customer to notice, at the impulse-buy level. 12.5" x 12.5" x 23.8"